Receptacles are available in several styles and materials. 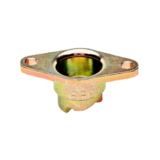 There are many options but, the most important distinction to make is do you want to use Fixed Depth or Adjustable Depth receptacles as this will greatly affect the stud selection process. Some industry standard systems use Fixed depth receptacles and various stud lengths to fit different panel thicknesses. We carry most of these types. 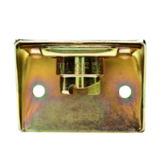 However, MilSpec also has an Adjustable depth receptacle that makes panel fitting much easier and requires fewer stud lengths to fit various panel thicknesses. If you have any questions or need technical assistance, please Contact Us for details, we will be glad to help. This drawing is for reference only. The chart below has the stud dash number in the far left coulmn. This is the number that is stamped in the head of the stud. The column to the right shows the Total Material Thickness range (TMT) of each stud length when using Fixed Depth receptacles. Dimensions are in inches. For metric conversion, use this formula: Inches x 25.4 = mm. mm ÷ 25.4 = Inches. If you have any questions or need anything else, please Contact Us. * When using receptacles number 99R10 or 26R48 series, adjustments to the data below are required. Please contact us for explanation and configuration data.